Google Pay has really grown over the last several months. It stepped away from the Android-specific branding and has added supported for loyalty cards and boarding passes. So what all can you do with Google Pay? Google Pay is Google’s contactless payment system—much like Apple Pay or Samsung Pay. But it hasn’t always been called “Google Pay.” In fact, that’s one of the more recent changes to the platform—it was called “Android Pay” for years before. But like with a few other products over the years, Google is stepping away from the Android-specific branding in an attempt to move into a much broader market. You can use Google Pay to pay for things with your phone pretty much anywhere contactless payment methods are accepted. Link your debit card, credit card, or PayPal account to Google Pay, and you’re just a tap away from paying for pretty much anything. You can also use Google Pay for purchases in some apps, like AirBnB, Fandango, and more. 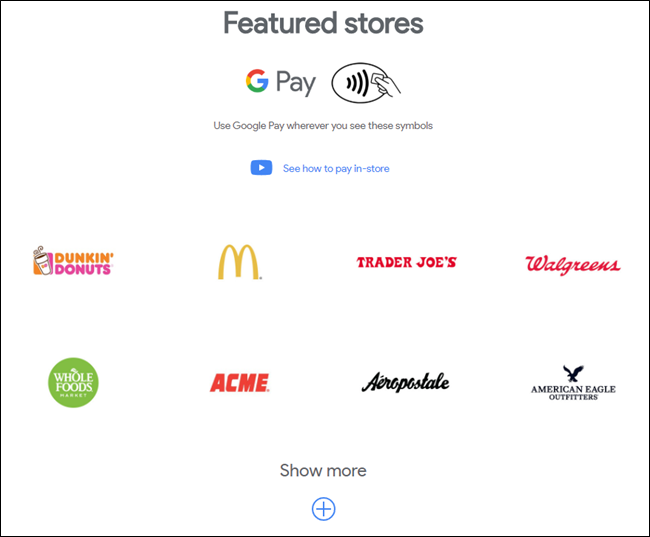 For a full list of places, both online and off, where Google Pay is accepted, head to the official Google Pay site. Now that we know what Google Pay is, let’s talk about setting it up and using it. 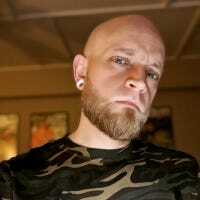 You’ll need a compatible phone (unrooted, KitKat and above, with NFC) to get started, as well as a Google account. Assuming you have all that, go ahead and install the Google Pay app. 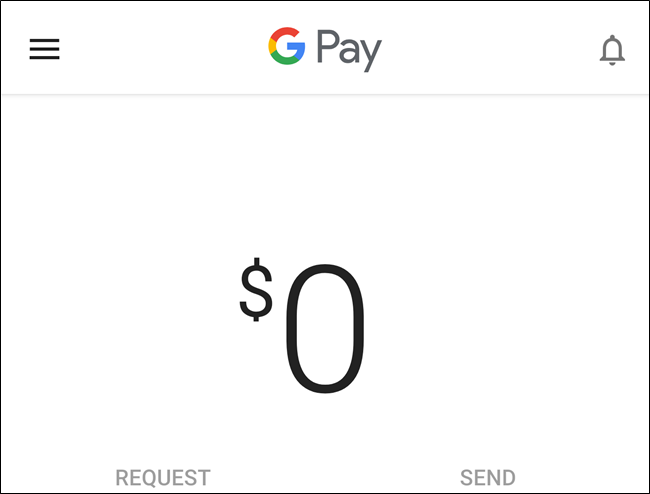 Google Pay is only available for Android, but Google Pay Send is available for iOS—we’ll talk more about that down below. After you install it, fire up the app. Tap the “Get Started” button to set things up. The first thing you’ll need to do is add a payment method, and you can use credit or debit card, as well as your PayPal account. If you have payments methods in your Google Wallet account, you can import those straight into Pay. Adding a payment method is pretty straightforward: just key in your card and personal details. Adding a payment method is fast, but occasionally some banks will require additional activation. That generally takes a day or two. 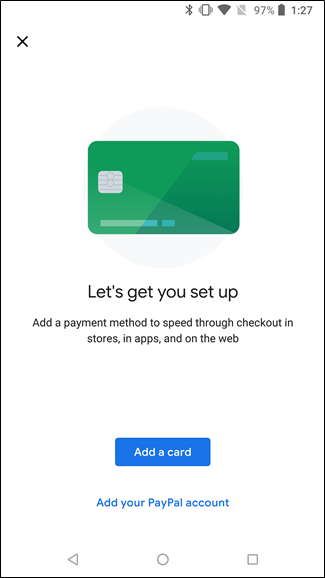 But once everything is set up, you’re ready to use Google Pay. And using it is simple. When you’re at a place where Pay is accepted, just unlock your phone and touch it to the terminal. Bam—NFC will do its thing and you’ll pay for your stuff with the default payment method. Nothing to it! But! There’s more to Google Pay than just paying for things. You can also use it to store other types of important information, like loyalty cards and boarding passes. 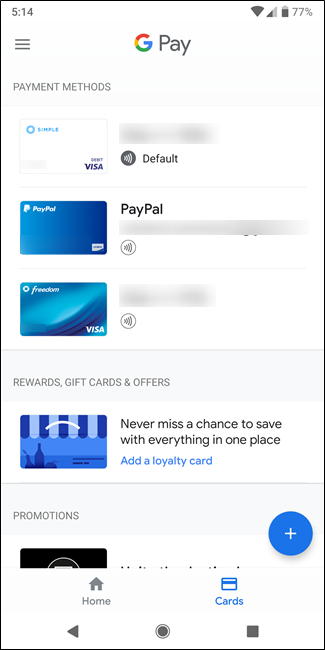 Aside from just paying for things, you can store all (or at least most) of your loyalty cards in Google Pay so you don’t have to keep up with the actual cards (or those stupid keychains). To add a loyalty card, tap the “Cards” button at the bottom. To add something, just tap the plus sign in the bottom right corner. Next, choose the type of card you want to add. You can add new credit or debit cards, loyalty cards, and even gift cards. 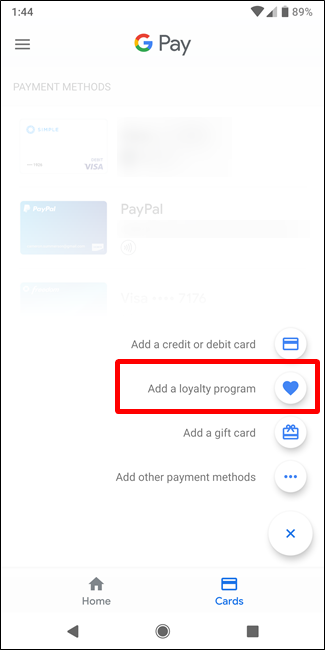 If you want to add PayPal or Visa Checkout, tap the “Add other payment methods” button. We’re going to add a loyalty card for our example here, but you can add whatever you want—adding different things works much the same. 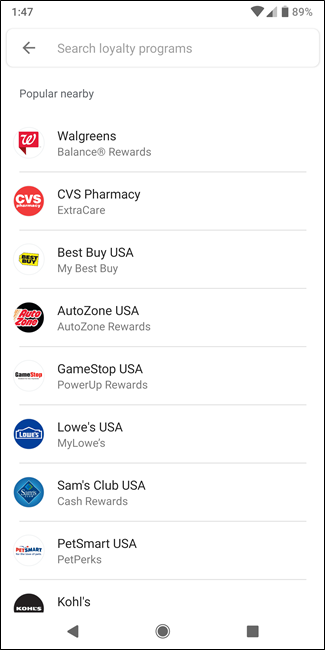 When you add a loyalty program, you’re shown a list of popular nearby programs, but you can also search for other programs. 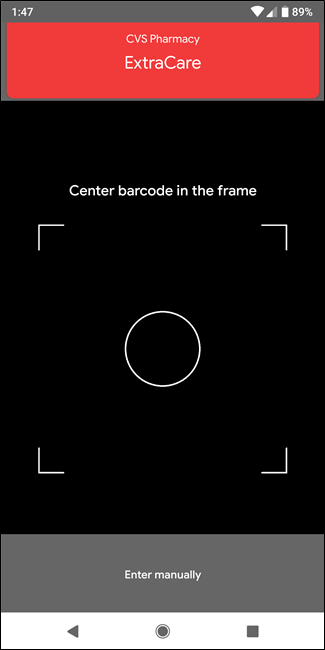 After selecting a program, you’ll use your phone’s camera to scan the barcode of your loyalty card (in most cases, anyway—you have to sign into your account with some of them). 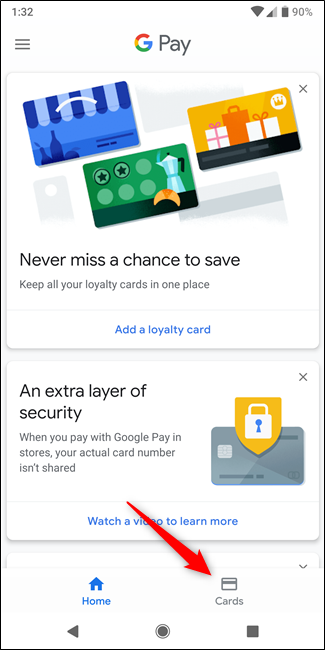 From now on, instead of fumbling around looking for your loyalty card or having to tell the cashier your phone number every time, just fire up the Google Pay app, swipe over to the cards screen, and find your card. But it’s not just about loyalty cards—you can also add transit passes for certain areas. Right now, Hop Fastpass and Las Vegas Monorail users can add their transit pass to Google Pay, which is likely a much easier way to keep up with them. When you purchase your ticket, just choose the “Save to phone” option with the Google Pay logo. Finally, there’s a boarding pass option—but it’s also pretty limited in use. For the time being, boarding passes are limited to Southwest Airlines. Just like with transit passes, you’ll link your boarding pass to Google Pay from within the Southwest Airlines app. Tap the “Save to phone” button with Pay branding, and there you go. Cool, So What is This Google Pay Send Thing? Yeah, the Pay Send thing. This service is available for both iOS and Android, and it’s really just a simple way to send money to other Pay users. Instead of sending money over PayPal or Venmo, for example, you can just use Pay Send. That’s pretty much it.